MANSON — Those who participated in the Sept. 7 Lake Chelan Shore to Shore Marathon, Half-Marathon and 10K are again giving the race good reviews. For the second consecutive year, Shore to Shore received high marks from runners and walkers surveyed afterwards by RunWenatchee, the group that has put on the annual event since 2011 for the Lake Chelan Chamber. 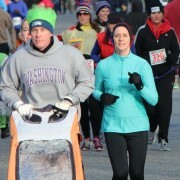 More than 35 percent of race finishers completed the online questionnaire. Runners hung out together following the race in the finish area at Manson. 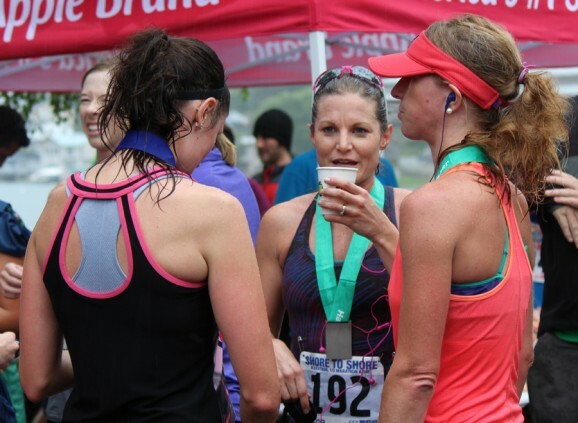 — Despite an uncharacteristic rain that fell the entire race, 82.5 percent of respondents rated the event as excellent or very good. Another 10.6 percent described Shore to Shore as fairly good, while 4.2 percent gave it an average rating. Just 2.7 percent rated it poor. A year ago, 74.0 percent rated it excellent or very good. — 96.3 percent indicated they would likely recommend the Lake Chelan race to a family member or friend. Just 3.7 percent said they would not do so. A year ago, 91.4 percent indicated they would recommend the race. — 84.5 percent said the event was extremely well organized or very organized. A year ago, 58.6 percent gave it those ratings. — The race’s 16 aid stations, staffed entirely by volunteers, were rated as either excellent or very good by 93.0 percent of the survey’s respondents. 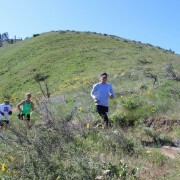 In a comments section in the survey, the Lake Chelan race received applause for its scenic point-to-point course along the water, its runner support and its organization. When asked what Shore to Shore can do to improve itself, respondents mentioned more porta-potties, a change to chip timing, putting up mile markers at every mile instead of every two miles, more lane closures, ensuring all runners get photographed, and spreading out booths at the finish area. This year’s race attracted a record 605 registrations, with 529 finishers. The previous record was set in 2012 when 400 athletes registered. The event generated an estimated $390,000 for the local economy through the purchase of lodging, goods and services. 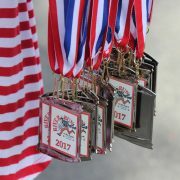 The race benefits the Chelan High School Wrestling Program, the Manson High School Athletic Department, and the local chapter of Girls on the Run. The 26.2-mile marathon begins on the south shore of Lake Chelan just past Field’s Point Landing; the half-marathon starts on the south shore near Karma Vineyards; and the 10K begins from the north shore on Highway 150 near the Lake Chelan Shores Development. Shore to Shore was first run in 2001.